This is the complete player's reference to Kingdom Building organizes all the rules players (and GMs) need to explore new lands, build nations, and defend against invading armies consolidated into one easy to reference tome. Starting with rules included in the Kingmaker Adventure Path, this volume expands every aspect of kingdom building and mass combat and delivers new feats, spells and class options to give PCs the edge in conquering and ruling their own corner of the world. Your PDF download now also includes a HeroLab data file! More than any other Paizo AP (in fact, more than any other campaign I've run in 33 years of gaming), Kingmaker requires legwork for the GM and lots of it. Not only do you need to run the players through the adventure as presented, but if you want to get the most out of it you need to create scores, if not hundreds, of vibrant NPCs, give each PC their own plotlines to develop, and think several game-years (at least) into the future. The result can be an unparalleled immersive experience for everyone involved, but make no mistake, it takes a LOT of work to make it so. Therefore, anything that can make your life easier as a GM is something to buy, treasure, and recommend to others. The first thing to take into consideration is the title. I think it's a bit unfortunate, since this is far from just a PLAYER'S reference; GMs will find much to love here. I purchased the PDF version, so my comments are limited to that. Physically it's a nice book, with a lovely cover, good B&W illustrations throughout, clean text and presentation, and not a lot of page background to mess with readability or devour printer ink. The first section deals with exploration and is essentially a restatement of the rules in Stolen Lands, with a couple of nice additions like a size-comparison chart showing how big a kingdom is with RL comparisons. It's fine, but nothing thrilling. Next is city and kingdom improvements, which is where the book starts to shine. All Paizo's buildings are listed, but additions are made for cities (like Office of the City Guard and Witch's Hut), rural areas (like Apiary, Winery, and Royal Preserve), and even castles (ranging from a fancy art collection through a moat to an anti-scrying room). This is where the book starts to become indispensable, as much time, effort, and balancing will be saved by having these structures ready to hand, in addition to giving players more of the options they crave. A much-improved random events table is also included. Next up is mass combat, and the additions here are very useful indeed, ranging from new army types (everything from various size militias through orc raids to everyone's favorite shambling undead cannibals) through new attributes (like bleed, crusader, and mercenary) and rules to generate the sort of humanoid hordes we all know and love. If you plan to feature a lot of mass combat, you NEED this. A short section on new Feats follows, which gives both traditional (e.g. Armored Swimmer or Tumble Strike) as well as Kingdom (e.g. Aid Another Leader or Inspiring Ruler)and Mass Combat (e.g. Mass Combat Focus and Inspiring General) options. Again, for someone really wanting to get into the building rules that make this AP special, this is excellent stuff that you will make use of. The next section is for new spells, and it's here that the only real problem I have with the book comes, in the form of the various "Summon Army" and "Summon Nature's Army" spells. They're only usable by mass combat units, but I still think the present serious balance issues. Still, YMMV, and I'm sure some GMs will find them perfect for their games. A very interesting section, somewhat misnamed as "Secret societies and organizations," comes next. it has two 5-level prestige classes and a pair of new archetypes, all of which are good, useful, and interesting, but nothing in it can replace, say, the sort of thing found in the Faction Guide if players wish to found their own organizations. Two pages of magic items are the last major section, and these are generally useful, especially the magical statues that grant kingdom bonuses when placed in Parks. More could have been done with kingdom stat-modifying items, but that's a quibble. Rounding out the book are several pages of revised forms for kingdom tracking, which is fine, although I think the majority of GMs find that the kingdom must be tracked through computer spreadsheets. These forms are fine and you'll like them if they're the sorts of things you like. Overall, this is a truly exemplary resource for players and GMs using the Kingdom Building subsystems in their games. It's not perfect, but it is clearly a 5-star product and an absolute steal at its price. When I decided to start up my Kingmaker campaign, I knew I had to have this book from the reviews I've read and it hasn't let me down. My group is still slogging away through book 2 but they have already gone through 4 and half years of kingdom builing. The players have enjoyed the extra buildings and, as the GM, I've really enjoyed the expanded random encounter section. Additionally, being available in print makes it more convenient to flip through at the table. What also impressed me was the community support of this product by creating an excel spreadsheet that incorporated the extra material in this book. This has made the kingdom building aspect a breeze to keep track of. The book starts from the basic exploration, kingdom/city building and mass combat rules as presented in the Kingmaker AP Chapters 1, 2 and 5. As written it's quite useable and has a few interesting changes as noted in previous reviews, such as the change in the square miles of the area a hex encompasses. Trivial point: the area of Washington D.C. is a bit under 70 square miles, so you can fit more than 5 of them in a single hex. The kingdom building chapter adds in a substantial expansion on "farmlands" from the original rules, changing this to "open spaces development". This is the best part of the entire book, one I am adding in toto for my own campaign. This gives a reason to remember where your various landmarks are at on your kingdom map, as you can do something with most of them. The revisions in this book for building cities and the changes in the actions by size of kingdom in my opinion are unnecessary. There are a few new buildings, some of which are "odd". The majority of the new buildings are underpriced variants of the tradesman building in the regular rules that don't require houses be adjacent. The Keep is a variant of the Barracks that costs too much. The additions to Castles are nice, although the moat is badly explained and the 'wards' one is either overkill or far too easily bypassed by other means. Best to remove it from availability. Mills are incorrectly assumed to only be used as a lumber mill and require substantial water access. More mills are likely built and used to grind grain than mill lumber and can be build on a much smaller river or stream than can a pier. As these rules stand, you have to have a carpenter for quite a few important items - which means in order to build various stuffs you will want every city built on a water border to build the mill that the carpenter requires. This doesn't really work well... Some of these discrepencies derive from the original material. The militarily-required buildings are generally unecessary as well, although they are tied into the mass combat section of this book. The mass combat system is a nice attempt at changing the admittedly basic one presented in Chapter 5 of the Kingmaker AP. The consumption costs are generally far too high, especially on a weekly basis. The training system works well enough, although using it as-is might not be so satisfactory for some. There is a new tactic for victorious armies to learn and 4 new resources to upgrade armies with. These are also good additions and ones I plan to integrate in toto. I suggest that the poison resource inflict damage to the army using it as well unless that army is comprised of creatures with the poison use class feature or that are immune to poison. There are several special abilities added - only Mercenaries is worthwhile. 'Bleed' is best left as originally presented in Kingmaker as part of the 'poison' special ability, while 'Crusader' is too subjective. Everyone will argue that all of their armies are crusaders to shave those consumption costs down. Vassal armies I think are a good concept that in the book that is not well executed. The army construction rules present an interesting concept: limiting maximum army size by 'method of conscription' - based on whether the army in question is conventionally recruited and trained (marshal), divinely acquired (planar allies?) or 'arcane' (which covers all the rest of them). There are several new feats presented, most pertaining to govorning your kingdom or leading your armies. They are good enough to use, although Sickening Strike I would remove. Dirty Trick is already able to do this and doesn't quite require the "feat taxes" to acquire the feat. The rest of them seem fine, although Mountain Strike I would caution against unless you are willing to have some of your bad guys get it too. The mass combat spell section has some problems as well. I cannot recommend integrating it as-is. The summon army spells are - while written for entire armies of wizards/sorcerers/clerics/druids - an especially bad idea. The effects of summoned monsters on this scale are sufficiently covered by that army's "spellcasting" special ability. The only two non-army spells of note (besides the two that deal with scent) are (a) magic wall - which omits the very important detail of how much it costs and what the minimum caster level should be to make it permanent; and (b) wall of tentacles. My beef with this supplement's army building rules are identical to the original ones - purely RAW they are way too easy to abuse. Armies of hound archons are the same cost as an army of 5th level fighters - both are a base CR of 4 as a Medium army in this example. The same complaint goes for armies of golems, pixies, rust monsters, great wyrm dragons ridden by 20th level wizards and so on. There should (in most campaigns) be a hard cap on what one can recruit and train in such numbers. This supplement attempts to reign that in by the consumption cost / week of resources = same as the cost to purchase. This really doesn't work well, as it makes armies too expensive without addressing the core problems. The magic items are largely fine - but I caution against the trio of statues. As they're written, a group could plant one of each in each city for pretty cheap and rachet the kingdom's bonuses up even further. In a nutshell, one park per city(6 BP, most often either 3 or 1 BP) 'unlocks' access to these statues. Presumably the PCs are able to craft them, so they cost half. The +1 statues are a bargain at 2.5 BP each - the reason? Each *city* can have one of each statue in their park. I recommend house-ruling the highest such bonus provided by these statues be applied to the entire kingdom as an enhancement bonus. Otherwise, one set of +3 statues - at a 'retail' cost of 135 BP - provides the same benefit as placing a set of +1 statues in each of 3 different cities at a 'retail' cost of 22.5 BP. For the same price as one set of +3 statues, you can acquire a +18 to Economy, Loyalty and Stability for the entire kingdom, provided you have 18 cities, which is not hard to do. I picked this up for a Kingmaker campaign I'm running. It collects all of the rules from Kingmaker for exploration, kingdom building and mass combat in one place. While I have not taken the time to do side by side comparisons, all of these rules systems seem to be expanded and the expanded material blends seamlessly with the original material. The absolute best part of this book is it can be easily shared with players as a reference work while performing kingdom maintenance without making the adventure and gm-eyes only sections of the Kingmaker Adventure Path books easily accessible to players. For that reason alone I consider this book money well spent and an absolute essential for any GM running a Kingmaker campaign. Other reviewers have already summed up how immensely useful the content of this book is. There's no need for me to rehash that. The few typos and lack-luster art would not be enough for me to deduct more than half a star. Unless the printing method has changed, the copy I received has a folded and stapled binding with non-glossy pages. Had I known that before-hand, I would have simply purchased the PDF-only and printed my own copy. I much prefer the more durable type of bindings used for the Adventure Path volumes, and appreciate the fact that I can open them even to the foreword or bestiary and still have them lay flat on my desk without issue. The same cannot be said for a stapled binding such as this. As feedback then, I would just like to say that I find far more value in paying a few extra dollars for a good-quality binding than saving what amounts to a couple cups of coffee. Would I buy it again? Yes. I'd buy the PDF and then bind my own copy. 6/04/2011: Note that as of the 2nd printing, this book is now perfect-bound! Great to see customer feedback implemented so quickly! Adjusting rating to 4.5 stars for the book too which it up to 5. Note: One small thing to keep in mind when using this book is that the hexes are of somewhat different size than those in Kingmaker. They are 12-miles to the side, whereas the ones in Kingmaker were intended to be 12-miles from center-to-center. The difference is 375-sq miles vs. 125-sq miles. Very little (if any) effect on gameplay, but I figured it was worth mentioning in a review. More info on the difference here. Now Available for Preorder. Expected in May 2011. 48 pages. This book combines all three pdf Book of the River Nations supplements into one handy book and includes new material. Plus it comes with Jon Brazer Enterprises' PDF Guarantee. Hmm how about the people that bought the first three books? Will the new stuff by up for them? I mean i would be interested in the new stuff but not if I had to rebuy everything again. We're still figuring out exactly how to handle that. We have to talk to Paizo on our options. Now with the pretty cover image. The artist did a wonderful job. Is this going to include any of the Book of Beasts for the River Nations, or is it just the three kingdom and exploration expansions? Does this include the new book of feats you recently came out with? Asking cause if it does. i will likely wait on the feats books then. Would make this not as bad to buy. This will include the exploration, kingdom building, mass combat, feats, spells and secret societies sections as well as an expansion to the kingdom building, mass combat, and secret societies (archetypes and PrCs) sections. Sorry Kvantum, no monsters inside. Is this going to be print only? Or will you be offering a PDF too? and/or a print/PDF combo pack? It'll be available as a Print/PDF combo and as PDF. 's cool. Just wondering which one(s) I still need to pick up in addition to this. ...this will work fine for me as I only possess the monsters book. Hope there is decent new material, as I already have the three sections currently offered, but I'd buy the physical book anyway for use at the gaming table. PDF printouts just aren't the same as a book. the 3 PDFs come to about 38 pages when laid out for the book (after consolidating things like title and OGL pages) the remaining pages are going to contain new material. I'm finishing the magic item section tonight (magic crowns and kingly jewelry). we've expanded the farming section to allow for different options. Plus we added castle customizations. Just to name a few additions for the print book. Sell me on...the River Nations! Its not a setting. Its the Kingmaker Exploration, Kingdom Building, and Mass Combat rules expanded. The expansions include new buildings, new kingdom events, inclusion of how mass combat spells work, GMing advice, and more. Plus there are Feats, Spells, Prestige Classes, archetypes and now magic items to enhance any type of kingdom building campaign. BTW are you going to offer a PDF of this collected set? Yep! The PDF will be available around the same time as the print. Maybe a few days earlier but it'll be days before, not weeks. And everyone that buys a print book will get a PDF for free! So instead I'll ask, know about when this will be for sale? May is my best guess. Lot of things can make a date shift and at current I don't have enough experience to make a better guess. Available to order via FLGS? Also, you still get a free PDF when you purchase through your FLGS. If they take part in Bit and Mortar, your FLGS can give you the PDF, otherwise JonBrazer.com can let you know how to get it. We're getting the test print in this week. Once we make adjustments and ship it off for the full print, we'll have a better idea. I didn't do a good job of explaining, so let me do better. When I get the test print back, I may need to make some minor changes or I may need tomake an overhaul. That could be 24 hours or two weeks. I think it will be on the low end, but I don't know for sure. Then there is the print run. The first print run for the Book of Beasts was at the printer for more than a month. I don't use that printer anymore. This printer was had faster turn around times but I am cautious for other reasons. All signs right now are pointing it to come out mid May. If things go smoothly, it could even be early May. If things take longer than expected... I might be praying for enough copies to take to PaizoCon. But for doom and gloom scenarios, I'm relatively confident it'll out in mid May. So to reask the question, for those who have bought the 3 separate PDFs, will they receive updates from this new book? Or will one have to buy this book? I'd like to be able to give you a solid answer on that one. All I can say at the moment is that I am working on it. As soon as I have a solid answer one way or the other I'll be sure to say so. Thanks for getting back quickly. I look forward to your answer. Just a quick update: The book went to the printer this morning (about 5 minutes ago to be exact)!!!! I'm hoping it'll be back from the printer within a week. If so, expect to see it at Paizo (and your local game store) 2-3 weeks from now. If it takes longer at the printer ... it'll take longer to get out. 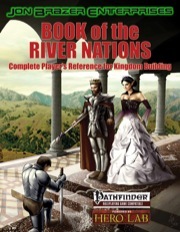 Preview week for the Book of the River Nations: Complete Player's Reference for Kingdom Building has begun. Today, download wallpaper for your computer monitor and see the whole cover of this beautiful book. Cool! Can't wait for this one! Preview Week for the Book of the River Nations continues with the Table of Contents. How come this is now unavailable for pre-order? I believe Paizo is currently in the process of switching it over from Pre-Order print book to pre-order print/pdf bundle. Looking forward to this, as my Kingmaker campaign is starting next week! Today we start delving into the very heart of the book. Find out what is new and exciting in the Kingdom Building section. Ooh, I love the new ideas you have listed there for developing open lands and castles, especially given that one of the first things I'd ever do in a Kingmaker campaign would be to claim the Stag Lord's castle for my very own. Looking for magic items fit for a king? Check out today's preview. I want to get this and the monster book... when I get the spare cash. I just hope its available for my next order from Paizo which will be in the next week or so. Any chance? It looks awesome. The book left the printer today. So next week is a likely possibility. Veryy cool. I guess my next question is when will Paizo update it so that I can pre-order it? 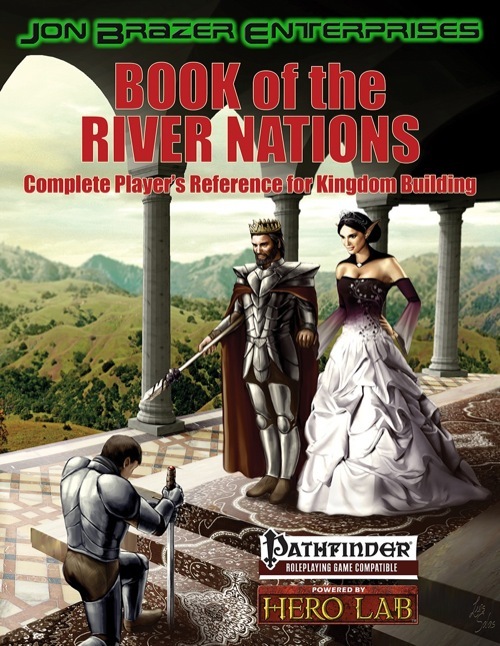 Finishing off the Book of the River Nations: Complete Player's Reference for Kingdom Building preview week, we talk about the PDF Guarantee and we definitively answer the question about those that purchased the three separate Book of the River Nations PDFs. Check it out! Anything other than straight up and down and directly a the camera. You know, tilted a bit to the side, not directly at the camera. Just something so you didn't copy the picture directly from the website and stick it in a photo of you.